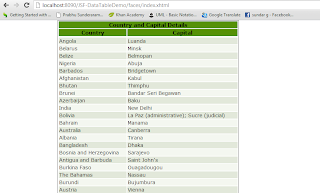 The data table component in JSF2 is used for displaying database table, array list, hash map, etc.., into tabular format. In JSP, if you want to display a table record in tabular format, we need to create a html table template after that we need to iterate the result set object. Here that is not necessary, because the h:dataTable automatically create a table template based on your inputs as well it have lot of useful attributes for specifying style class for HTML tags like table, th, tr and td. This is very simple use case of h:dataTable. 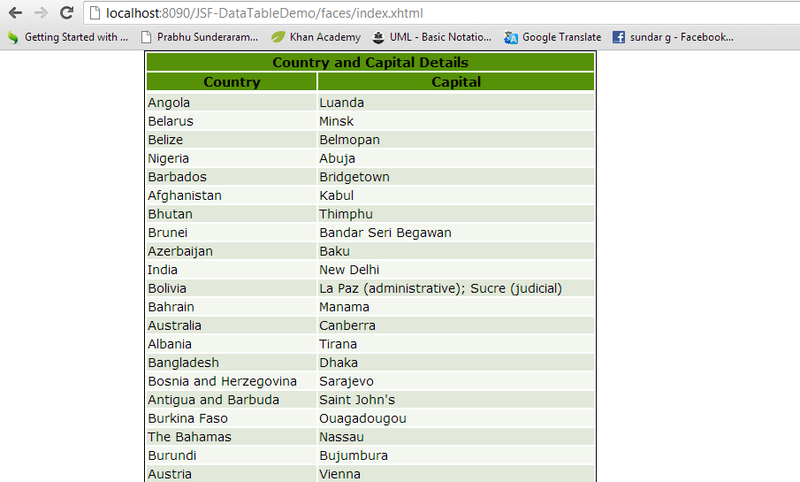 Here I am using HashMap, Inside the hash map I have all country name as key and corresponding capital name as value. Now I am going to display that hash map into tabular format using h:dataTable component. The rowClasses, columnClasses, header and footer classes are very useful attributes used for define your own css classes into table attributes. Download my entire application from github and see my managed bean, xhtml and css code. The result of application is like this. In this example I have created the one json array as string, and converted this string into JSON object using eval() function. Using for-each loop I got all the key value from jsonObj, and finally using that key I got the corresponding value. I hope you have visited my part1 of my tutorial. Let’s see the steps for integrating hibernate framework into Spring MVC. Here I have used MySQL database. I have created one database called “springmvc” and created one table called “user” with userid, username, password fields. I have inserted some records into table like this. Step 1: Creating User POJO class. We need to create a User POJO class for mapping user table. Ok let’s create it. Step 2: Creating hibernate mapping xml file for user class. In hibernate we need to create hibernate mapping xml file for all domain class for mapping into corresponding database table. Instead of creating xml file you can use annotation for mapping domain class into database table. This is my mapping xml document created for mapping our user domain class into user database table. Step 3: Creating authenticate service class.